Lola was still feeling out of sorts, even though she had been awake for a while now. She almost didn’t dare get up and journey into the kitchen, not knowing just what would greet her? Lola just stared about the kitchen as if she expected something out of the ordinary to happen. What then was ordinary anyway? Didn’t the kitchen blow up last time, because the door was frozen shut, then their son Howie and his friends at the mall in Our Homer…..Our Homer? Lola turned away and considered going back to the sanctity of the bedroom, but she also knew that sooner or later, she’d need to return to a “normal” way of living, whatever that was? “There! You see” yelled Lola. Howie is a boy with arms and such!” Howie and his father just looked at her, as if she had, but she hadn’t, had she? Lola looked into the refrigerator, but when she turned back around, Howie just stood there with his new Nerf Football in his mouth, and anticipation in his little eyes. Lola went into the bedroom but emerged again with the < symbol around her neck. Lola just nodded before she yawned a big yawn, and watched as her two boys reached for the door handle. “Race you to the fence, Old Man” yelled Howie and tried to dodge his father’s long grasp, when the Nerf Football was in play. They just smiled and nodded, as they chased each other out of the door. Lola just walked over to the window to see how they were doing, but only saw them trudging through the snow, looking for the Nerf Football. “Lola” yelled Bunky. Come and help us out. You know how hard it is for Howie not having hands and all!” Lola just looked at Howie, and he just looked back and blinked. She turned tail and went back into the bedroom, locking the door behind her. Come on Lola, she said to herself. Get a Grip! We are not Moose, not right now anyway, and Howie is not a person, not at the moment anyway, and it is the winter in Alaska, isn’t it? …If only someone would answer her thoughts and confirm what she was thinking as true. If only there was a Vision Moose around that could…. “At last” thought Barney as he thumbed through the daily newspaper, concentrating on the Racing Form and who was running at Soldotna Downs today? He looked at the Vision Screen, seeing that Lola needed his help again, though she must have been pretty far gone to ask for his assistance, when she only partially believed in him, and what he stood for. He really loved this part. Slowly in front of Lola’s eyes, a mist appeared, and little by little his shape appeared with just a hint of a bluish-light that seemed to glow about the edges. Lola just looked at him, without saying anything at all, with Barney’s big friendly smile appearing first, almost in a Cheshire Cat way of imagining. Lola thought about Howie. Sometimes, it would be nice to talk to him and get a response, but other times, she knew there was a bond between them regardless of the circumstances. Barney just laughed and said, “Remember when you were younger and were arguing with your sister? Out on a lark, high on a cliff, with the both of you tearing each other’s hair out, shouting and all, when you slipped and almost fell? Why out of nowhere, a strong gust of air, almost like someone butting you up against your backside occurred, saving your life at once!” Barney’s eyes sparkled like Kenaian Mineral Water, without the ice as Lola just sat there and stared incredulously. “You see. 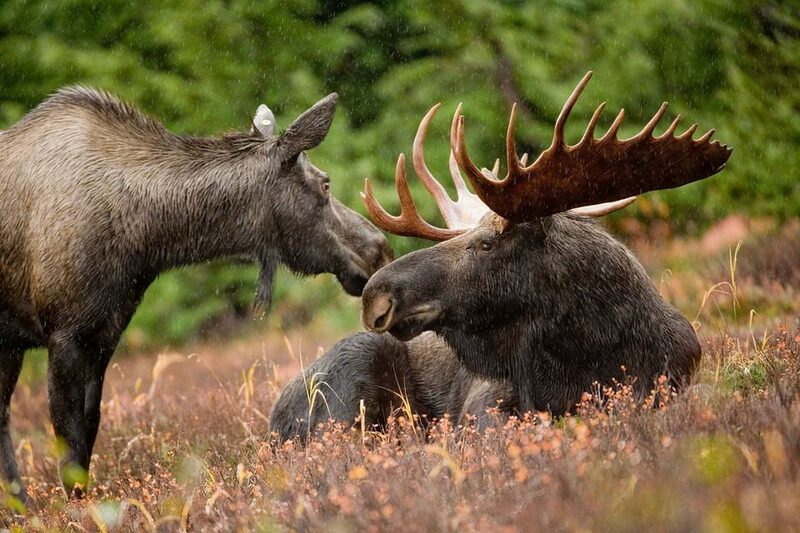 You never know when a Vision Moose might be around to help out…. Lola got dressed, brushed her hair and teeth, took a deep breath and went outside. Fantasy, Reality,, short story, Vision Moose, which reality if best?